In Ranong, the busy fishing port in Southern Thailand bordering Myanmar’s most southern point, the Marist Asia Foundation serves the poor through well-run education and health programmes. From Myanmar, easily visible just across the strait, a short trip in small open boats transports thousands of Burmese seeking refuge in Thailand. If they do find work it is often poorly paid and in challenging conditions as in fish or charcoal factories. The long rows of their cramped single-room dwellings, often alongside or within factory enclosures and regularly swamped by the region’s frequent rain, reflect the poverty of their family environment. Hindered further by language and political difficulties, the Burmese refugees are the true poor of Ranong. In 2006 the Marist Fathers initiated a social justice mission project to serve these poor at their expressed point of need through two main ministries. They provide education as a key to development out of poverty and into leadership, and they care for HIV patients by personal home visitation, medical education, and by practical assistance in dealing with agencies and government. 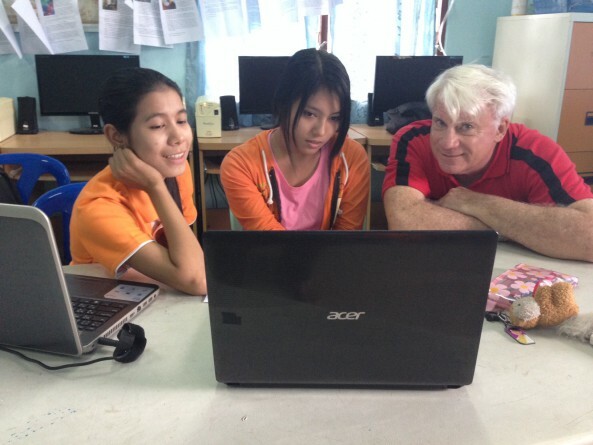 The early mission project has developed into the well-respected Marist Asia Foundation. Under that name, Marist Fathers (SM) work alongside Mission Sisters (RNDM), paid local staff, and also volunteers from overseas. Both the education team and the health team cooperate well and work in and from a suitably simple but well-built Centre. Education is targeted by local need to preschool and secondary levels. The mission also involves working alongside students of the Australian Catholic University On-Line programme, and those studying more English in hopes of entering that programme, as they all aspire to become worthy future leaders for their families and country. The health team cooperates with the hospital and receives their referrals. The Foundation structure was approved in 2014. It sets a base for hopefully ensuring a reasonable level of ongoing financial support, an environment of good responsible practice and professional process, and to conform to government regulations. It has been my pleasure, privilege and joy to work alongside the Marist Community and their leadership teams, families and students for 3-4 weeks and to experience again the challenges and joys of mission in the tropics. My earlier 18 years working in the Oceania mission field in Samoa, American Samoa and Tokelau Islands, prepared me for feeling very much at home again as a Marist in this mission environment. The big difference is working in Asia. Ranong is more densely populated and has its own unique merging of cultures, religions, relationships, difficult-to-learn languages and demands of life coping with life in Thai society. I enjoyed being Marist in the pastoral and mission-minded team of Marist confreres, invited to share from the inside some of their joys, hopes, griefs and practical challenges. They expressed a genuine Marist spirit in positive and encouraging relationships with Sisters, staff, families and students, and their easy teamwork approach resonated well with me. A happy and caring community atmosphere is strongly felt throughout the ministries. The Burmese families are clearly very appreciative of the practical compassionate help given to raise them up from very difficult living conditions and for the personal (Marist) attention shared with them. Another special joy for me was how the On-Line University students were so happy to trust us and our responses as Fr. Frank and myself worked with them one-on-one through their stories and essay work by posing open ended questions to help them improve their expression of thought and grammar. Their moving personal stories covered topics like their real family situations and their journey to education, and also their well-considered reflections on key issues they knowingly face as future emerging leaders of their families and country. To be trusted to listen alongside them as they struggled to clarify their own thoughts and their hearts’ deep desires with such openness, honesty and passion is a specially privileged Marist memory I will prayerfully reflect on further. We also worked among other senior students studying more English grammar with earnest hopes for entry into the On-Line programme, and I realized that, even there in the context of coping with difficult Burmese and Thai languages, I have much to learn again even in English! Visiting with Fr. Gil and his health team some HIV families in their poor lodgings, listening as they willingly shared their personal stories in eager and much appreciated dialogue (I knew only the visible emotions in their nonverbal communication), also exposed me to a variety of human struggles and caring interactions important for ongoing reflection and prayer. During these my last few days, Fr. Kevin has just returned from overseas. As Director of the mission he has the overall administration responsibility of the whole project and also has special pastoral care of the staff and students of the pre-school and secondary programmes. He also unites the Marist Community in their prayer and action in this vital Social Justice work. During our daily Mass and community prayer, sitting in the Marist community’s “upper room”, an open verandah chapel that overlooks the beautiful ever-changing mists on the Ranong mountains, I gratefully reflect in prayer on the many key changes of the human heart and life, in myself and in those we serve. Probably much like my confreres, my own journey to Ranong started long ago in a family environment of prayer and commitment to social justice and so developed into a longing to serve as a Marist and priest on mission among the poor. I take to heart and prayer my varied experiences as a Marist on mission as I now prepare to continue my travel journey to process it all during a Hesburgh sabbatical renewal in Chicago. I leave Ranong with a very big thank you to you my Marist confreres for the opportunity and privilege to share a little of your life and mission from the inside. Also a big thank you to the Sisters, staff, volunteers and families we worked alongside. A final huge thank you to the ever cheerful, respectful and engaging students who so enjoyably shared, with amazingly open simplicity and trust, their deepest joys and new hopes, their griefs and challenges of being Burmese refugees in Ranong, poor but ever so grateful for being given a new chance to radically change, develop and lead others by their adopted family, the people and supporters of the Marist Asia Foundation. Thank you. Thank you. Khorp khun khrap. Ce zu tin ba deh.